PraxisBörse is the central job and career fair of the University of Göttingen. On two consecutive trade-fair days on the Northern and Central Campus you will have the chance to discuss the career entry and career opportunities offered by the exhibiting companies. Small and medium-sized companies are represented as well as very big names. 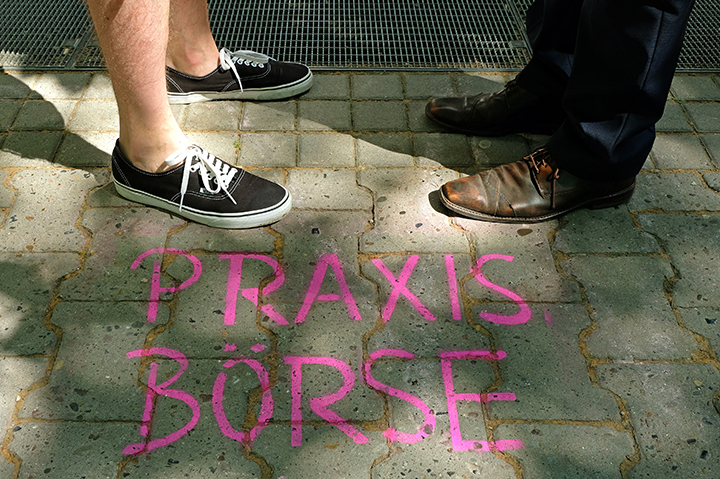 In 2019, PraxisBörse will take place on 21 and 22 May from 11 am to 5 pm. On our website you will find current information, tips and tricks concerning the career fair. The JobWall in the blue tower (in the central auditorium building) has been a permanent feature for years and also a central point to obtain information for students looking for an internship, a working student job or direct career entry. There are also information screens in the central auditorium building and on the northern campus with current job offers from our online job portal "Stellenwerk". Check it out! Support is open to students of all faculties and subjects. In cooperation with various excursion programmes of the University of Göttingen, we offer excursions to attractive companies every semester. On Facebook and on our central excursion webpage you can find information about visits offered for the current semester. Do you have an idea for starting your own business? The start-up support team will be happy to support you on your way to self-employment, e.g. by means of confidential one-on-one discussions, further training courses and workshops for prospective founders. › Just contact us to arrange an appointment! According to the motto "It's never too early, it's never too late", the Career Service offers you a range of individual counselling, events and online tools to prepare you for your career in all phases of your studies. We support you at an early stage in your application project and in discovering your potentials and perspectives - in the Göttingen region, throughout Germany or internationally. Alumni Göttingen: Students are Welcome! Alumni Göttingen Alumni Göttingen networks people who feel connected to the University of Göttingen, whether they have graduated here, spent a semester here as an incoming student from abroad, worked at the University or are currently doing so. › Students are most welcome at Alumni Göttingen. Membership is not a prerequisite for active participation in the Alumni network, and registration on the Alumni portal is free of charge.